A team of researchers at McGill University in Montreal announced that they've successfully reversed the symptoms of autism in mice. By restoring the production of a critical neural protein (which they had knocked out in the first place), the geneticists were able to alleviate symptoms consistent with the disorder. They caution that this is not a cure, nor is it the sign of a drug to come. Instead, this is a breakthrough that will inform the development of a multi-faceted approach to a syndrome that affects nearly one in every 110 people. The study, which was led by Nahum Sonenberg, began after the researchers developed a new mouse model for autism (though how the researchers can say they've created a mouse model that can accurately reflect the neurological and psychological complexities of human-borne autism is beyond me — but there you have it). 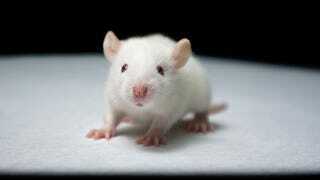 They then genetically engineered the mice such that they were deficient in a specific gene — what's called Eif4ebp2. This gene is responsible for the production of a protein called 4E-BP2, what thwarts the expression of certain messenger RNAs. So by removing this gene from the picture, the researchers were able to create mice brains that produced these proteins at levels above normal — what resulted in autism-like symptoms in the mice, including poor social interaction, altered communication, and repetitive behaviors. Sonenberg and his co-workers found that one group of proteins that proliferates in the absence of Eif4ebp2 is the neuroligins (NLGNs), which sit in the membrane of neurons and help to create and maintain the connections, or synapses, between nerve cells. When the authors examined mouse brain slices, they discovered that overproduction of NLGNs results in synapses that are prone to overstimulation, establishing a ‘hyperconnectivity' that many researchers believe underlies the symptoms of ASD. Based on this insight, the researchers went on to show that they could still reverse the effects of deleting the Eif4ebp2 gene. And they did so by concocting a small-molecule drug that could bind to one of the protein components of the translation-initiation process —what counteracted the gene deletion. After the drug was administered to the mice, their symptoms disappeared, restoring them to their initial state. Essentially, the researchers were able to correct autism-associated behaviors in adult mice. But this doesn't mean that a drug is around the corner. First, as we already pointed out, the autism mouse model maybe a poor substitute for human autism. Also, the deletion of a gene in an adult-stage mouse may create a condition that is autism-like — but not necessarily autism proper. Second, the drug that the researchers developed would be too toxic for humans. At best, it demonstrated that a pathway exists, and that there are identifiable therapeutic targets. And lastly, as Jones points out, "The search for drug therapies is complicated by the fact that [autism] has many genetic causes, each of which accounts for no more than 1% of cases." Nonetheless, the researchers suggest that these diverse mutations could be part of the same pathway, something that they'll have to prove. As an aside, given the potential for a genetically targeted autism therapy, we should probably start to consider the ethics involved. While some individuals with severe autism could certainly use the therapy, other people on the spectrum, such as people with Asperger's, may not require genetic manipulations of the sort — which could have a profound impact on their personality and psychological awareness. It's fair to say that this therapy should not be imposed upon anyone, if it's actually developed. Read the entire study at Nature.